Two of my favorite artists have joined forces to bring one eerie tale that could only happen in Florida. 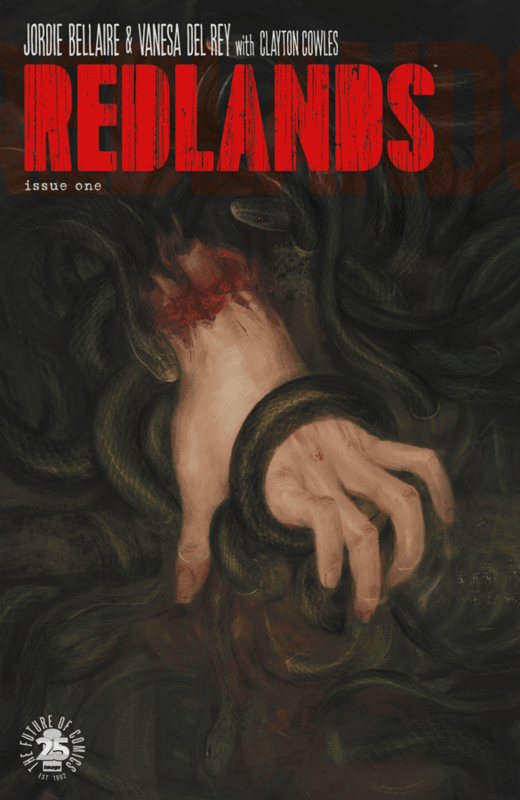 Jordie Bellaire writes and colors 'Redlands' with artist Vanesa R. Del Rey delivering a fast-paced horror story that will grab you by the throat. We descend directly upon Redlands, Florida where the hanging of three witches has gone awry and a terrified police squad is barricaded in their station. Bellaire wastes no time setting the scene and the mood in a frenetic pace. The hanging tree is set ablaze and something evil lurks in the air. It's the perfect tension where anything can happen and you're just waiting for the first ounce of blood to spill. The witches have turned the tables on their tormentors, these southern cops with their Confederate flag hanging proudly in their station will pay for trying to lynch them in public. The battle for Redlands has begun. The scene is reminiscent of George Romero's classic film 'Night of the Living Dead' where a number of people are trapped in a rural farmhouse under attack from zombies. The difference is in Redlands you kind of are rooting for the witches. The sins of Salem, Massachusettes still linger whenever witches are involved. Complicating things within the station are the disgruntled prisoners locked up in their cells. The cops are getting sandwiched between certain death outside and a near riot from within. Bellaire delivers some surprises that earn this title the mature rating. I first fell in love with Vanesa Del Rey's work on BOOM's 'Hit' with writer Bryce Carlson. The perfect style for a crime noir thriller. She's since done great work for Marvel and here on Image's 'Redlands' she continues to shine and get even better. Her wispy scratchy line style fits the southern gothic nightmare that unfolds into supernatural horror. Bellaire's color work is always on point and this is no exception. The first thing that captures your eye is the giant tree in flames full of yellows and oranges. From there, there are more subtle touches especially within the darkened station where the colors are suffocated in dim lighting. 'Redlands' blasts onto the scene with a mean streak and chills to spare. Bellaire and Del Rey make a potent team with a tale of vengeful witches in a god-forsaken city. The story consumes you from page one and doesn't let you go. It challenges you to identify who the true monsters are among us. 'Redlands' is a sure bet and required reading this week.